For the past year, the term “cryptocurrency” has been bandied about by people in the tech and banking industries, usually with admiration from the former and some scepticism from the latter. More startups in the region are beginning to contemplate integrating cryptocurrencies into their respective business models. Fintech firms too could especially benefit from introducing cryptocurrency into their operations. With the trend of e-wallets on the rise in Southeast Asia, integrating cryptocurrency would be an effective way to attract more users. In Southeast Asia, startups are catching up to the west by including cryptocurrencies into their business. An example is Coins.ph from the Philippines. Taking advantage of the huge remittance market in the Philippines, Coins.ph uses cryptocurrencies rather than cash to avoid the bank charges many Filipino workers abroad have to pay. Startups in the region have also started to turn to Initial Coin Offerings (ICO’s) as a method to raise capital. One such success story can be seen with Thai based fintech startup, Omise. It is reported that Omise closed US$25 million in investments through an ICO in July last year. However, since ICO’s are not normally regulated and are susceptible to scams; banks and governments have been sceptical of the benefits of cryptocurrencies. Over the past year, banks in Southeast Asia have been flip-flopping on the issue of cryptocurrency. While the disruptive nature of the currency has caused concerns for banks, many of these financial institutions do not want to be seen as archaic and unable to adapt to new technologies. 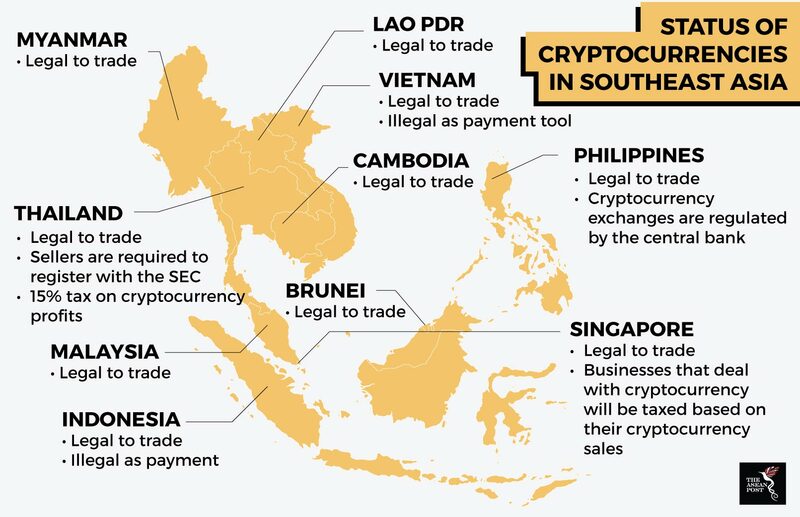 At the moment, most Southeast Asian countries are still deciding how best to handle cryptocurrencies. For most countries in the region, their current conventional laws do not cover cryptocurrencies, so by default cryptocurrencies are legal to hold or to trade in. However, some authorities may investigate occurrences of cryptocurrency use and trading on a case by case basis. In other instances, banks have released a statement or warning against trading in cryptocurrencies. In a statement released in October last year, the State Bank of Vietnam said that cryptocurrencies are not legal tender and "…issuance, supply, use of bitcoin and other similar virtual currency as a means of payment is prohibited." In Indonesia, the central bank there has warned members of the public that cryptocurrencies are not a legal medium of exchange and that the current boom of cryptocurrencies is only a bubble. Indonesia has also banned the use of cryptocurrencies as payment tools. Places like Thailand and the Philippines aren’t as hostile as Vietnam and Indonesia. Both countries have set up legal frameworks to regulate cryptocurrencies. In the Philippines, cryptocurrencies have been legalised and cryptocurrency exchanges are regulated by Bangko Sentral ng Pilipinas (Central Bank of Philippines). Thailand has also caught on by recently introducing a set of laws governing cryptocurrencies. Under the new laws, the Thai Securities and Exchange Commission has the authority to regulate digital currencies and its operators. The Thai Ministry of Finance has also revised the country’s tax code and has placed a 15 percent capital gains tax on all profits derived from cryptocurrencies. Meanwhile, Singapore has taken a more libertarian approach by allowing cryptocurrencies to remain legal and by not intervening in the market. Director of the Monetary Authority of Singapore, Ravi Menon stated in an interview in October 2017 that Singapore has no intention to regulate cryptocurrencies. Cryptocurrencies might be full of risks – from scams to potential bubble bursts – but there seems to be no signs of it going away, especially with the rise of fintech. Governments now need to decide on how to handle it best. They could go two ways, either the Thailand way or adopt the Singaporean approach.